The task was simple: to find out the meaning of ‘daruma’ in ‘Gold Class Daruma’. At best, I knew I was visiting a Japanese restaurant, not Event Cinemas, but I still wanted to know – it’s certainly one of the more memorable names for a restaurant. Daruma: a Japanese doll (likely). Dharma (less sure about this one – RIP Lost). A prostitute (whoa, that escalated). Actually a common household decoration, darumas can be found all over Japan. The dolls are sold with blank eyes, which are filled depending on your life journey: the first eye when you decide on a goal, the second when you achieve it. As such, darumas symbolise the very Japanese notions of perseverance and sacrifice. The restaurant’s frontage. 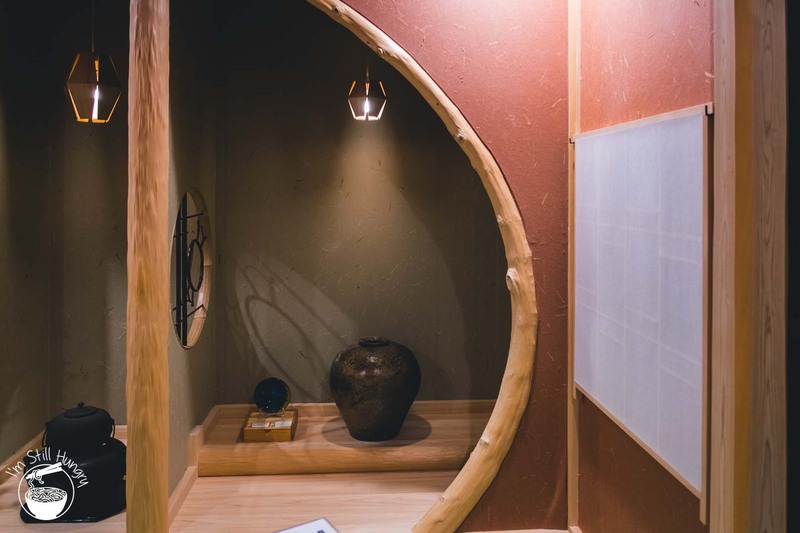 It’s hard to see, but there is a small, red daruma doll at the entrance. 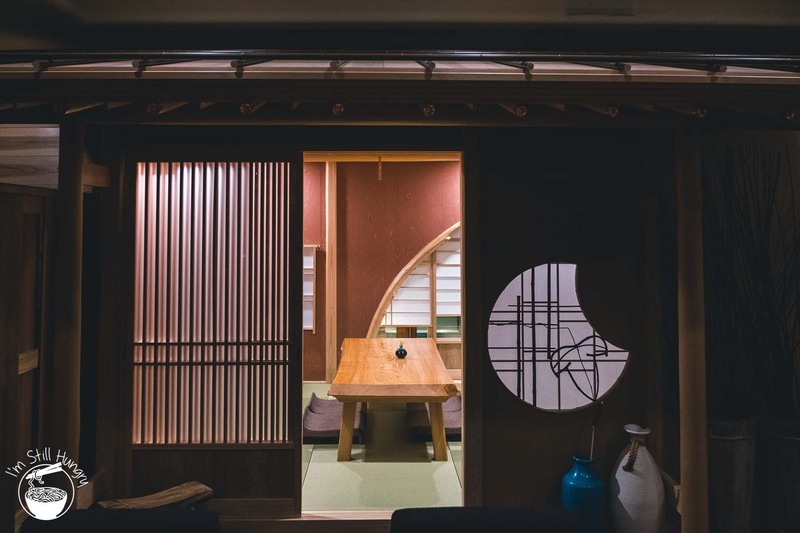 Located on the first floor of the Grace Hotel, Gold Class Daruma manages to shrug off typical ‘hotel restaurant’ vibes in its setup: a space sufficiently Japanese in its aesthetic, contrasting with the rest of the hotel’s surrounds such that it truly manages to call the space it occupies its own. 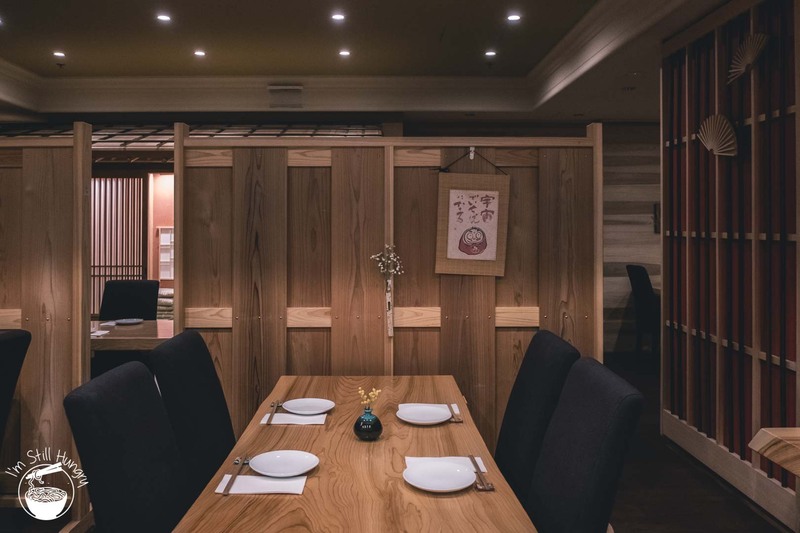 Inside are multiple seating areas: a long bar counter made from 500 year old cedar wood, a table dining area and a private room suitable for 4-5. The sections are semi-cordoned off from each other with byoubu*, which makes each space all the more distinct. Of course, no prizes for guessing the best seats in the house. The decor is almost stereotypically Japanese, as is the food. 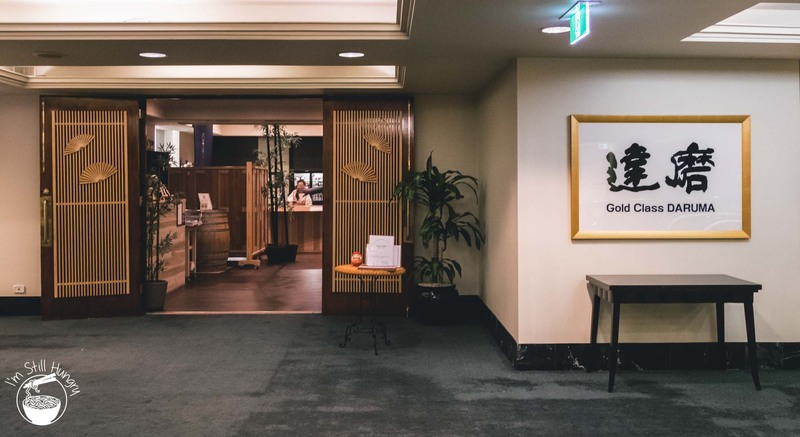 In almost every way, Gold Class Daruma’s menu is that of a typical identikit Japanese restaurant: there’s a lot on there, and it covers the spectrum. Raw stuff. Sushi stuff. Fried stuff. Salad stuff. Soup stuff. Grilled stuff. Dessert stuff. 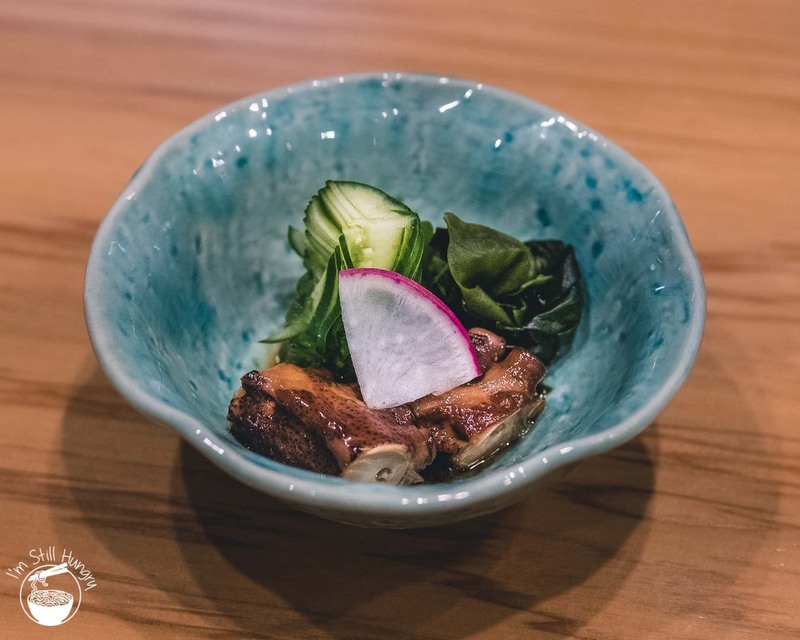 Almost every staple of Japanese cuisine can be found on its incredibly comprehensive menu, sorted into seven – or fourteen depending on how you count – sections. There are even two set menus – Hibiki and Yamazaki at $66 & $99 respectively – that take choice paralysis out of the equation. All this makes sense: it is a hotel restaurant, and maximum appeal is key. But I did say ‘in almost every way’. The party trick? Sushi omakase. In case I haven’t said it enough before: restaurants that offer this dining format are still rarer than hen’s teeth. And yet, my radar is clearly faulty: Gold Class Daruma has been serving it for more than a year. 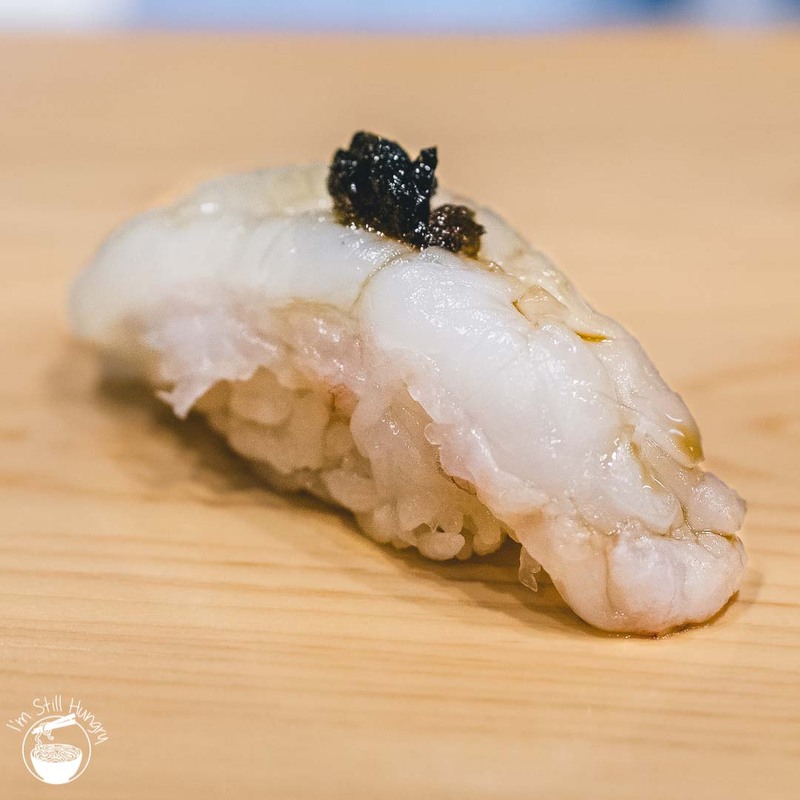 There was no way a single visit would cut it: a la carte and sushi omakase will each require their own visit. And so that’s exactly what I did. 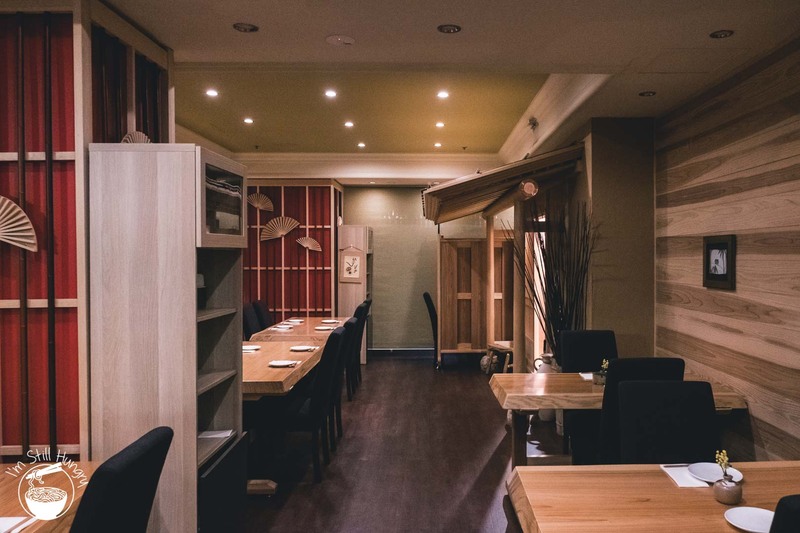 For a la carte, we booked the private room, something I highly recommend if you’ve got a group of 4 and aren’t doing the omakase. Five is not recommended given the available space. 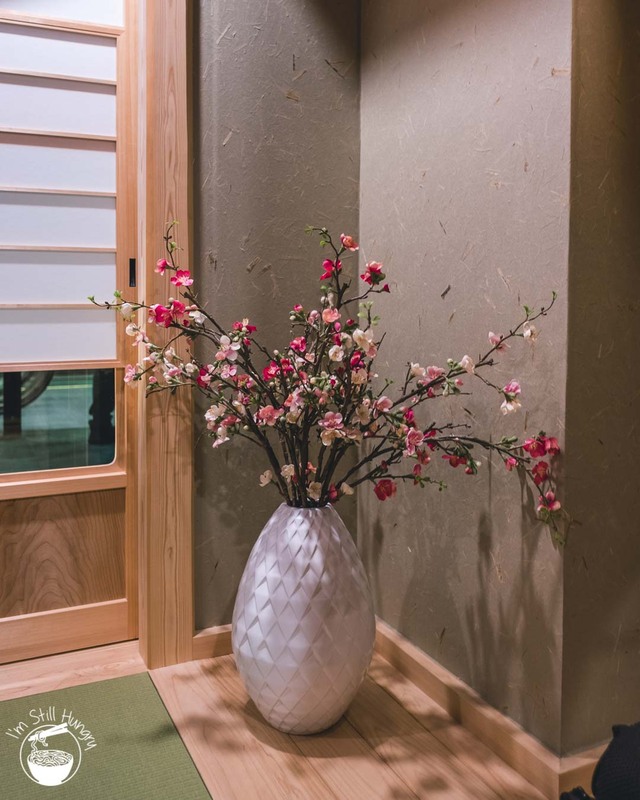 The private room is a bona fide washitsu (Japanese-style room), complete with the requirement that you take your shoes off. It is absolutely lovely. You know, the sort of thing you would video and put up on Snapchat/IG stories – that kind of nice. That said, people with back problems or won’t be comfortable sitting cross-legged will want to think twice. The room’s ventilation could also be improved, and flagging down waitstaff after the initial flurry of orders (say, for more drinks) was understandably difficult. Oh well, it was still nice. ‘Nice’ is also the same descriptor for our a la carte experience. There’s no point mincing words: manage your expectations. You’re not going to get Sokyo, but the environment’s certainly better. Come with a gastro-tourist’s mindset and you’ll come away disappointed. Do so with an open mind, good company and you’ll be alright. Daruma Deluxe – $99. A good sashimi boat! Not something I get often, so always a novelty when I do. 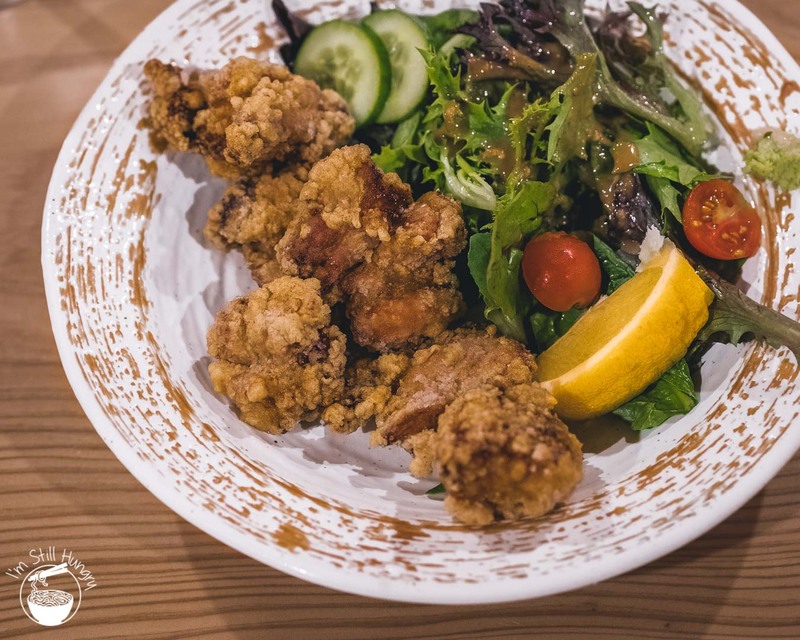 Chicken Karaage – $13. One of the tastier dishes. 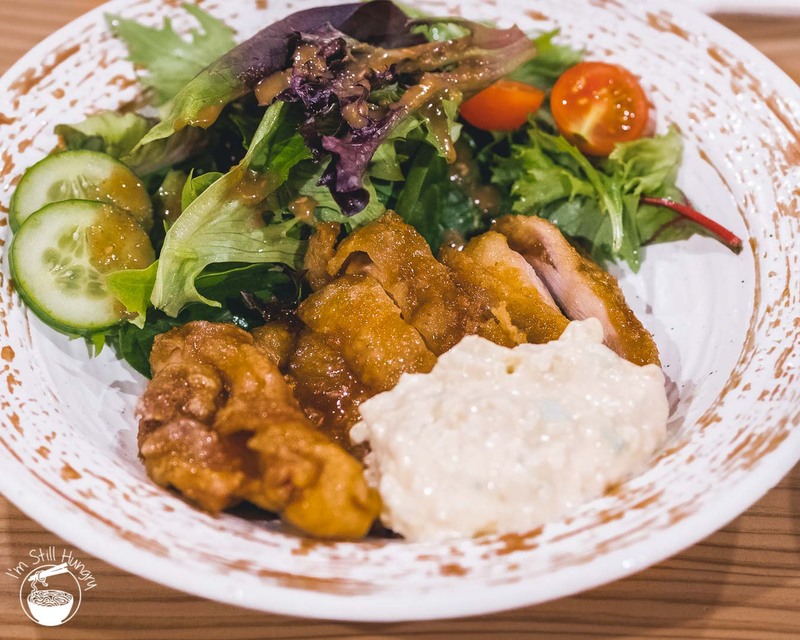 Chicken Nanban – $27. Not pictured was a pork katsu – $24. Both fried, saucy dishes. Satisfying dishes to be paired with a load of drinks. Preferably beer. 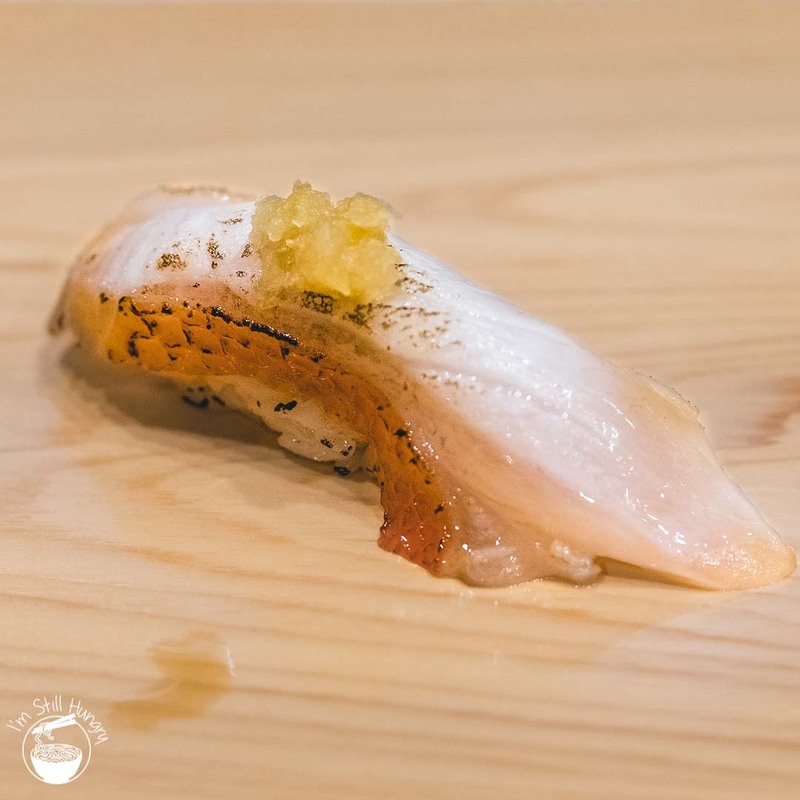 Nigiri [Salmon Belly – $6 / Kingfish – $5]. I can’t say these were crash hot. The nigiri were a bit sloppy in execution. 200g MB9+ Wagyu steak w/homemade ponzu sauce – $48. This was a really nice dish and a recommended order – the beef was done up a perfect medium-rare. 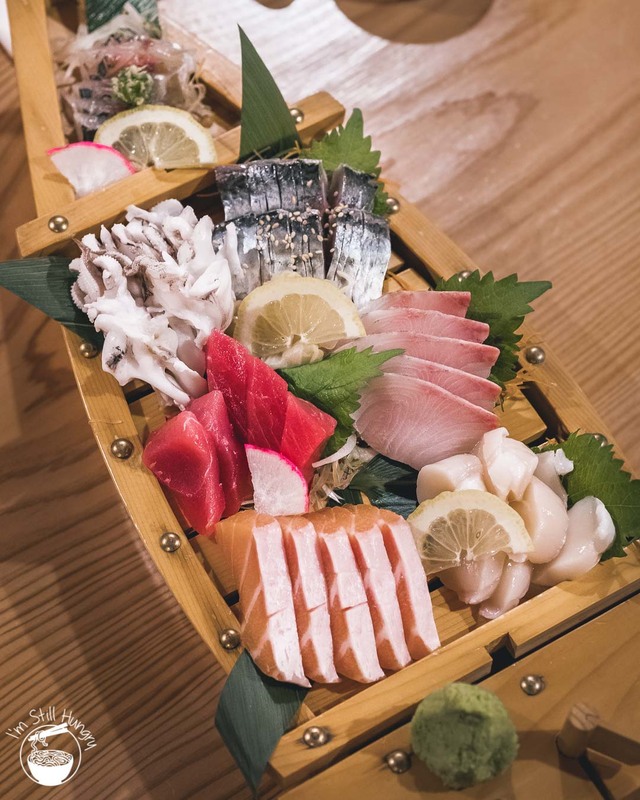 The food came quickly, albeit with unexpected priority: the sashimi boat came last, with the nigiri arriving halfway through after the fried meat dishes. Normally, I’d mind. 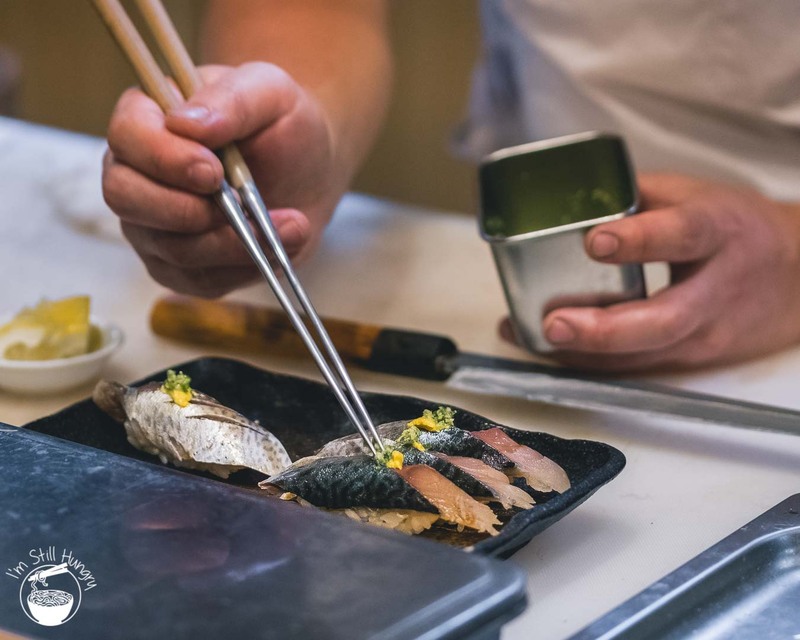 But I would rather eat first than wait excessively – that daruma deluxe takes quite some time to prepare. A set menu might be more appropriate if you consider pacing and ordering to be of particular importance. 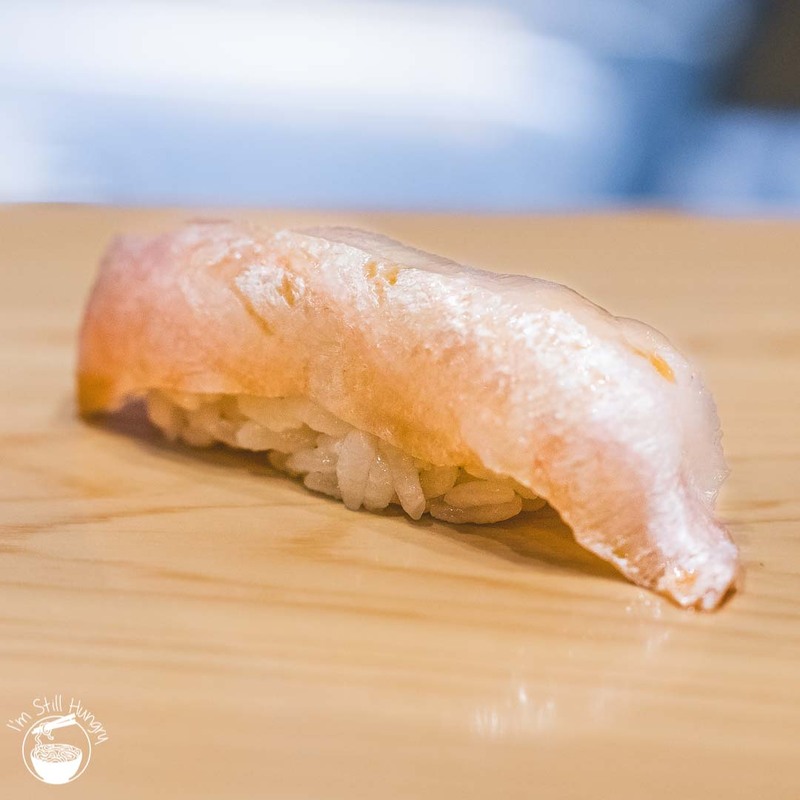 With Sashimi Shinsengumi putting up prices multiple times since last year, Gold Class Daruma now officially offers the cheapest sushi omakase experience in Sydney at $70. 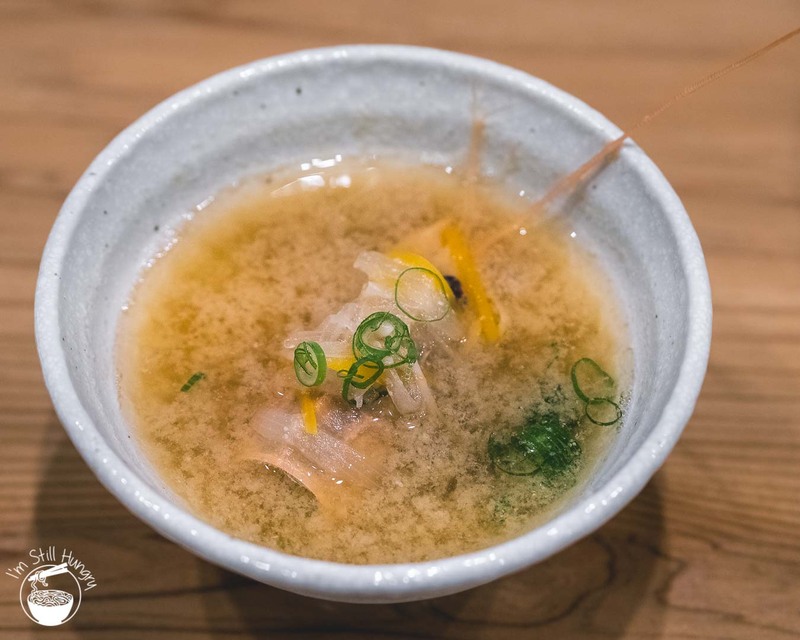 For the money, you get a 105-minute time-boxed experience involving one otsumami (snack), 12 pieces of nigiri, and as per the waitstaff’s explanation – a ‘complimentary’ miso soup – I’m not sure why that needed to be called out. 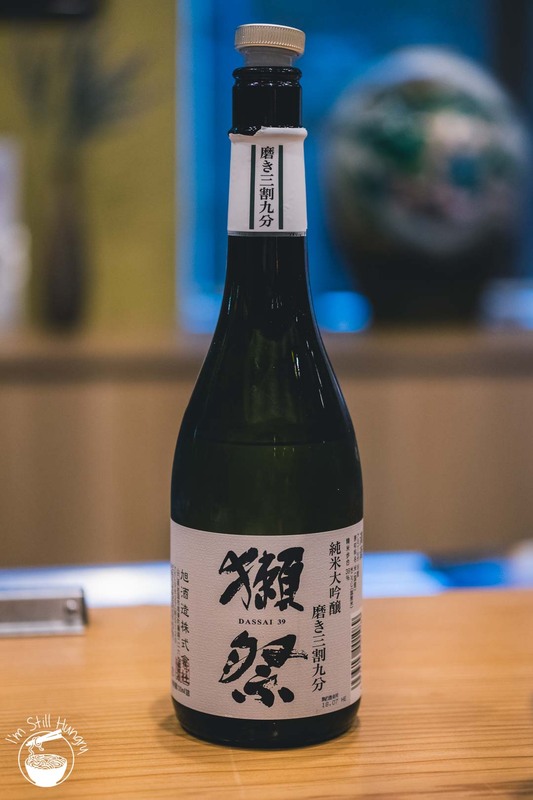 Dassai 39 – $96. Sushi and sake: it’s just how it is. An underappreciated aspect of the experience is that you can book Gold Class Daruma’s omakase with as little as two weeks’ notice. 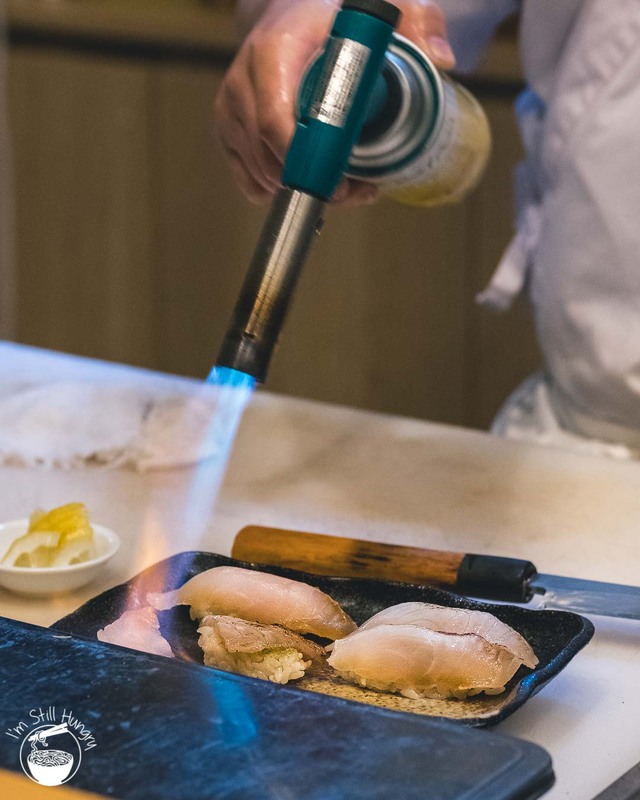 As such, the restaurant can officially fulfil any last-minute omakase cravings. Yes, we live in a world where ‘last-minute’ means two weeks. Ahem. On our visit, it was surprising that we were the only customers at the entire bar for the 6-7:45pm session – on a Friday night no less. 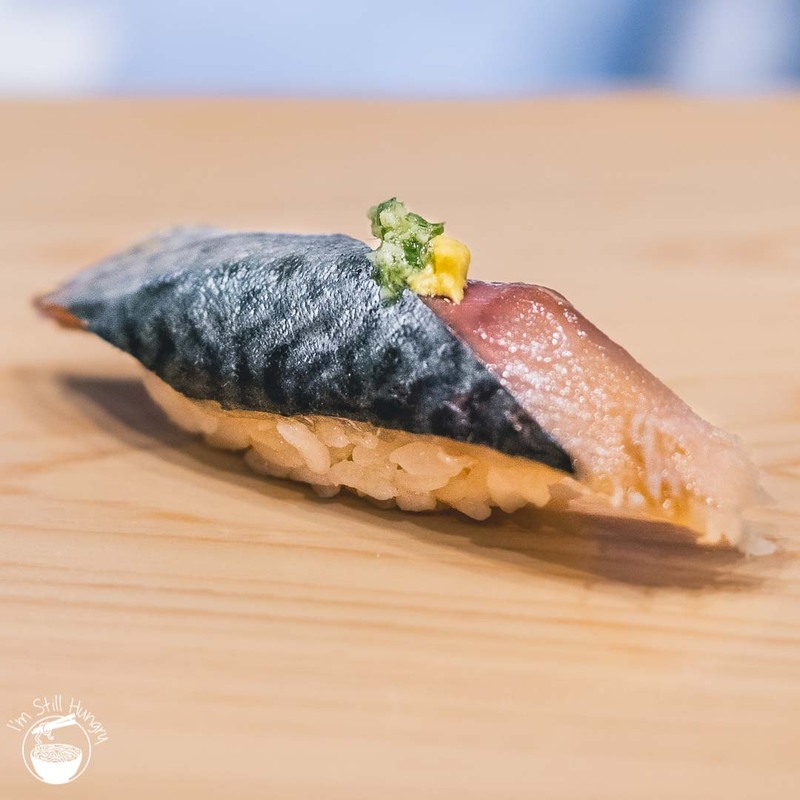 While that was eyebrow-raising, receiving sushi chef Shintaro Ito’s full attention is a welcome plus. Shintaro-san doesn’t talk much and comes off shy but man, he executes. 105 minutes doesn’t seem long, but the pace is brisk. In fact, at roughly 2.5-3min per piece, this is the fast serving speed I’ve ever encountered outside of Sukiyabashi Jiro. It’s a little too quick for me; 4-5 minutes apiece would be a more comfortable pace. Speed eaters will be right at home! 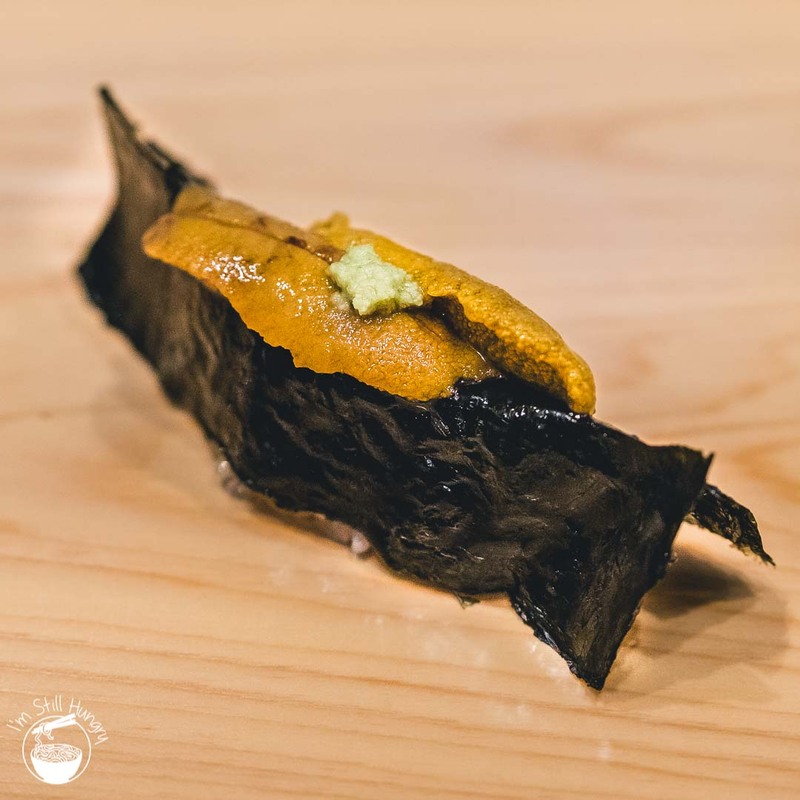 At the risk of sounding like a broken record to my more dedicated readers, the omakase scene in Sydney is positively miniscule, with less than ten places in the entire city that serve a bona fide omakase. However, even in in this rarefied company, not all sushi are created equal. Gold Class Daruma, here, delivers a silver – not gold – finish. Now, I readily admit that my pretentiousness when it comes to sushi knows no bounds, particularly with respect to my actual levels of knowledge (a fraud!). However, what I like is what I like. My biggest dislike with Gold Class Daruma’s omakase actually happens to be what I like most. Wait what? Let me explain: it’s all about flavour. The good part? The sushi is genuinely delicious. 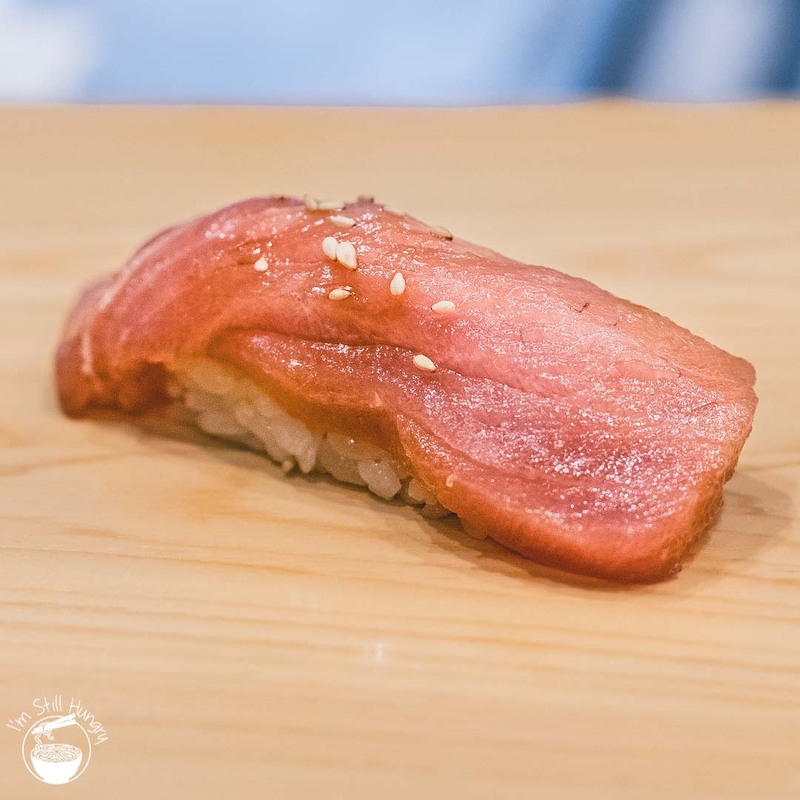 Most neta* are of good quality – for the price point – and well-seasoned with house-blended nikiri**, which actually varies depending on the sushi served. 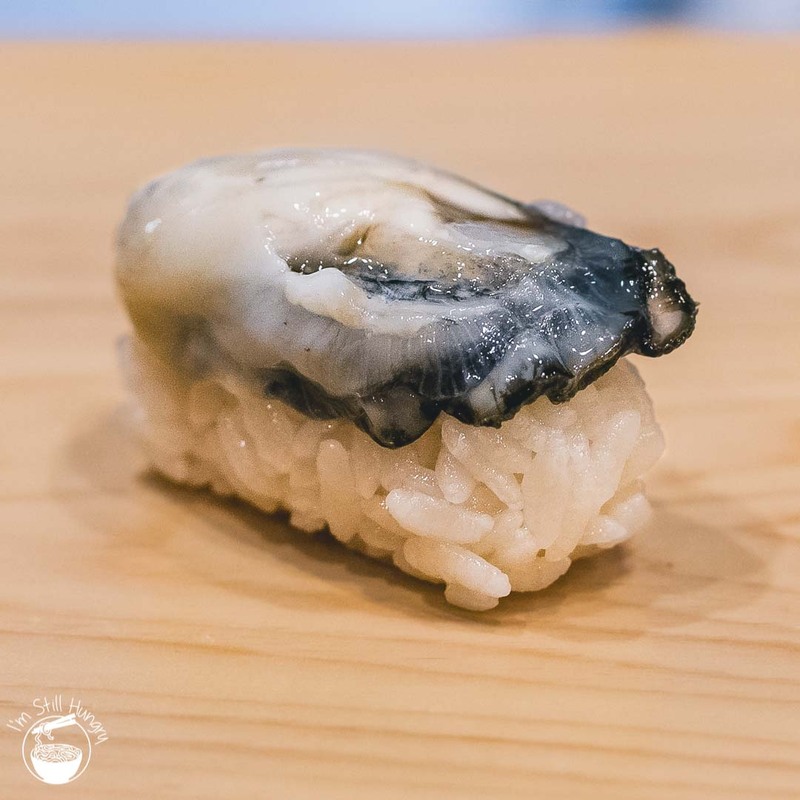 This is a good sign of a serious omakase. 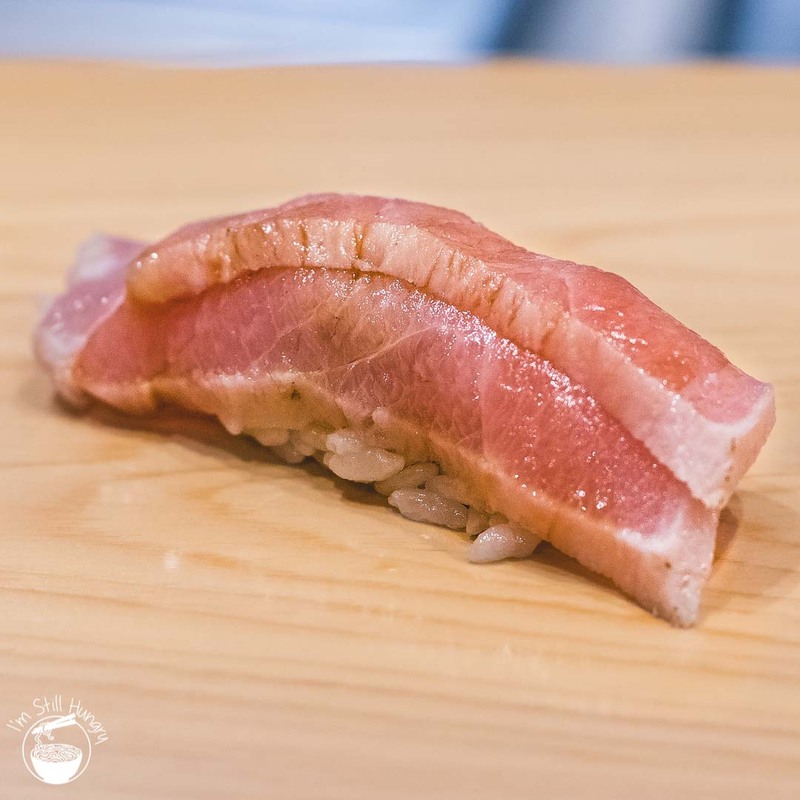 Standout pieces were the kinmedai (golden-eye snapper), chutoro-zuke (marinated medium fatty tuna), and ika (cuttlefish). 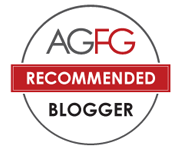 It is a significant vouch when I say I enjoyed most pieces, and none that I disliked (beyond personal neta preferences). That even includes the raw kaki (oyster! 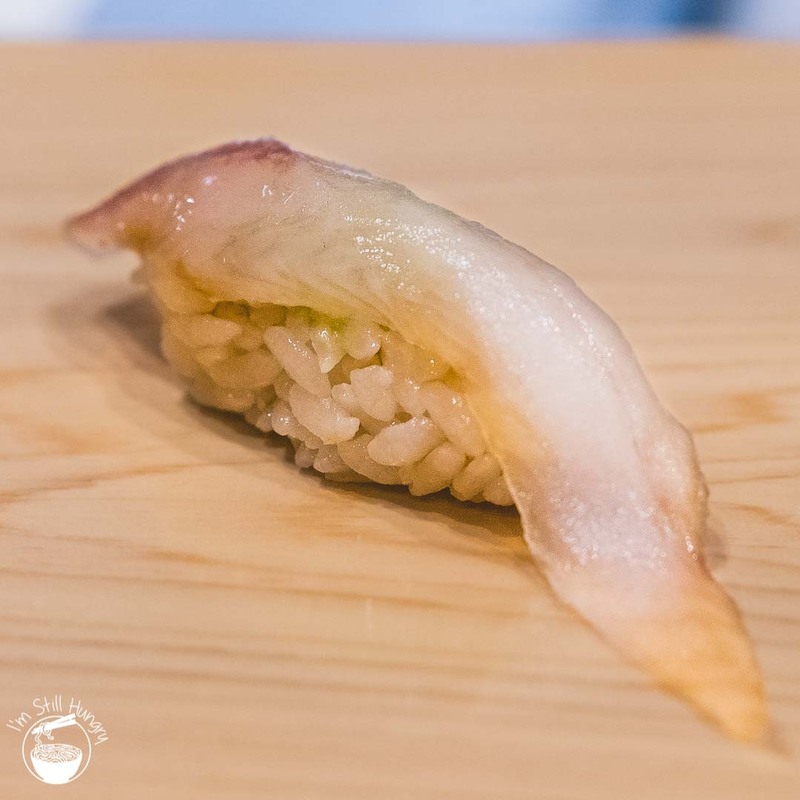 ), which marked the first time I’ve ever had such a neta as nigiri. Nice. *Technical term for component(s) that go on top of shari (sushi rice). I could just say ‘seafood’, but that’s obviously not always the case. **The sweet soy sauce that many serious sushi chefs will brush on top of sushi before serving. Recipes are, of course, trade secrets. So how in the heck is flavour an issue? On balance. Literally. Specifically, in the shari. It. Was. Strong. Overpowering at times. 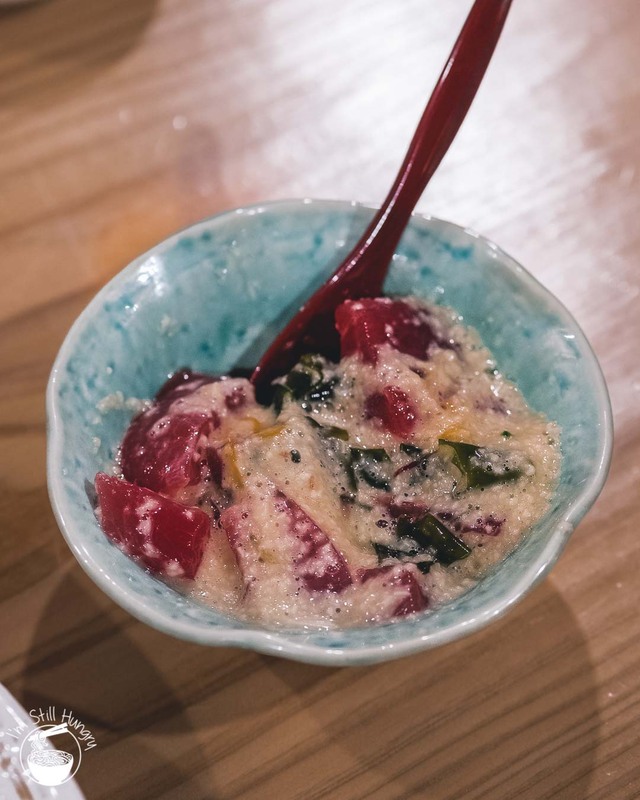 The sushi rice’s seasoning was, in every instance, more than necessary. The only balance was the out-balancing of the neta. Sometimes I tasted it less due to a stronger neta, other times it was just too much (say, with white fish). 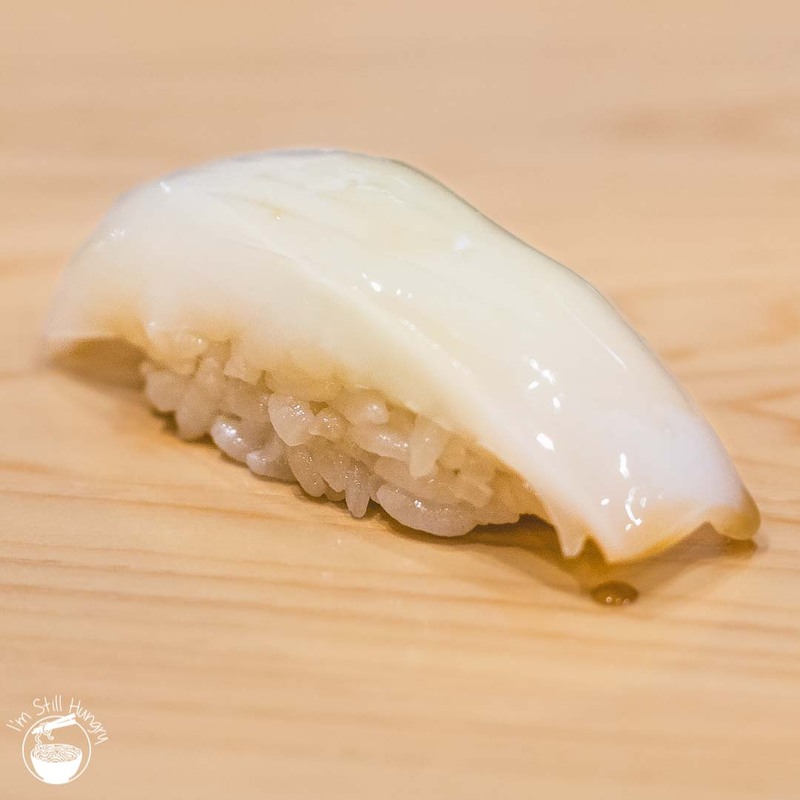 It’s not just about using different types of shari for different neta (another sign of a sushi chef that really takes their craft seriously), it’s about reducing even the base shari’s flavour profile down to an acceptable level. Fortunately, this should be easy to do. The second issue I had involved portioning. 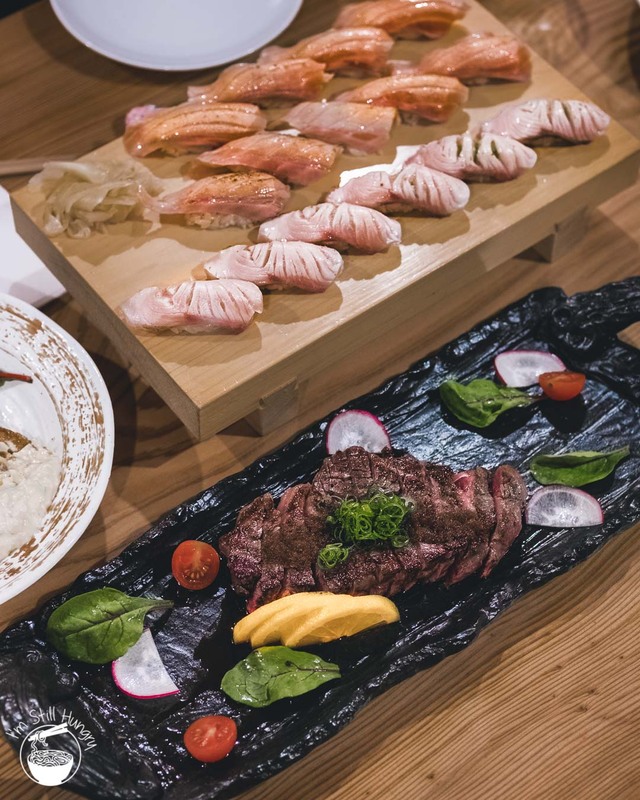 With a pricetag of $70, a 12-piece omakase is understandable and acceptable. However, I was quite surprised – initially positively, which quickly turned – that the pieces were plus-sized. Some pieces required deft manoeuvring just to fit it all in one bite. Considering that each and every piece should be a one-bite affair, this was a little too much. If you’re the sort of person who can’t eat too much rice, you’re going to feel it. The solution is once again simple: reduce sizes or better yet, serve a similar overall volume of rice, spread out over more pieces. It would also be a justification to increase prices: I would pay the difference. Kinmedai (goldeneye snapper). Great start. Akasagara (red cornetfish). A new piece for me! Chutoro-zuke (marinated medium tuna). A bit too strong. 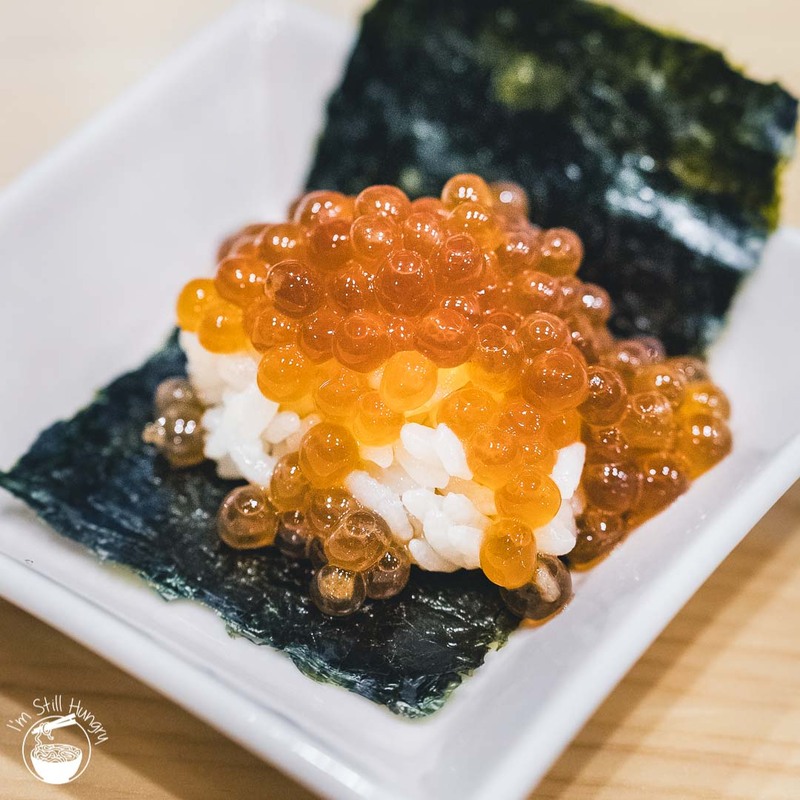 Ikura (salmon roe). First few bites were good, then got overly salty. Scampi. This didn’t taste too fresh. 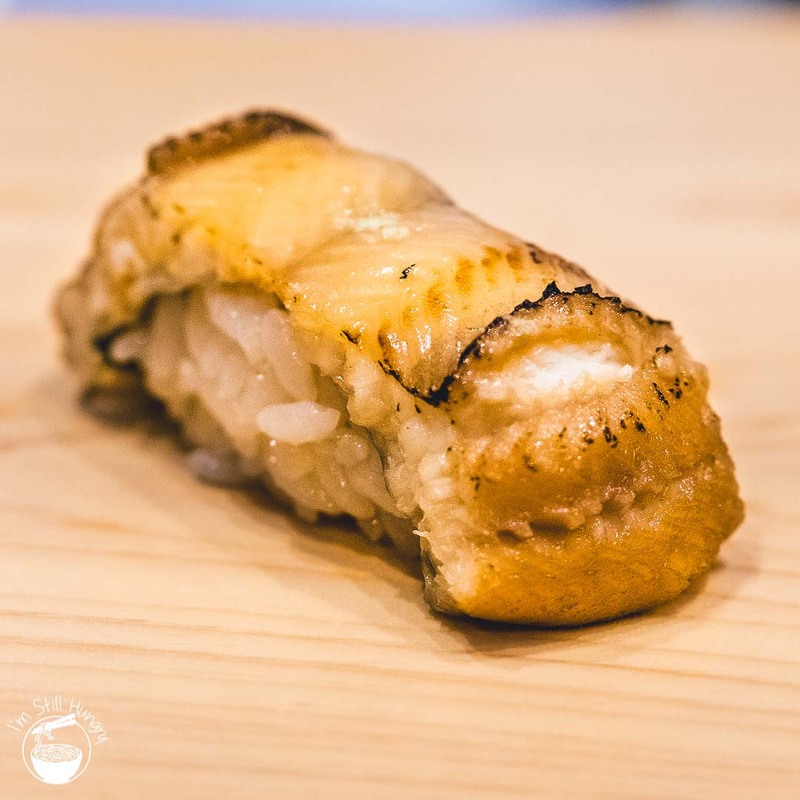 Anago (sea eel). Good texture, a little too salty. 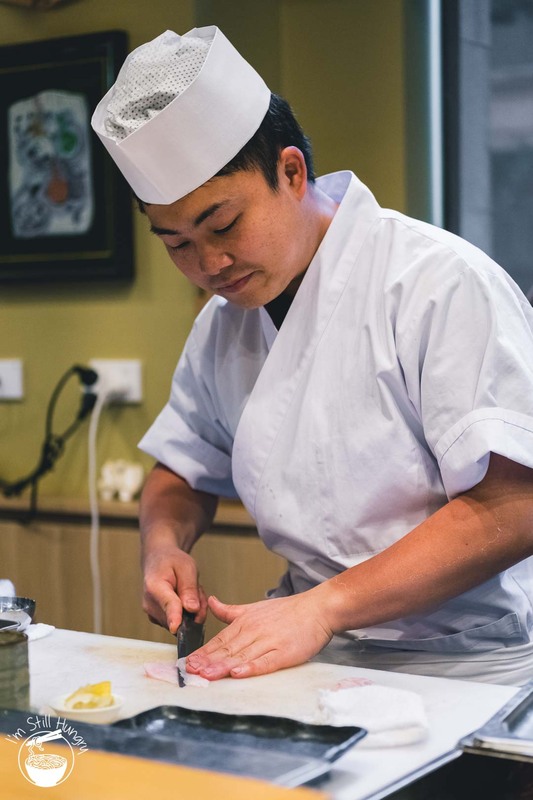 Shintaro Ito’s experience in sushi making can be counted in single-digit years. This makes you good enough in many realms. Even in sushi making – I say this at the risk of angering conservatives – this would also usually be good enough. 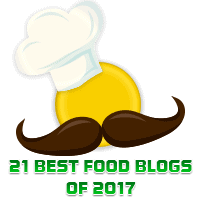 For a moderate, low-key sushi-ya. However, we all agree that to truly excel at this ostensibly simple craft takes decades, not years. The sushi coming out of Gold Class Daruma is certainly good in and of itself, but when there exists masters of the craft that have the benefit of sheer experience – people like Toshihiko Oe, Takashi Sano and Ryuiichi Yoshii – it would be remiss of me to say that Gold Class Daruma’s product is as good as any of theirs. It’s fitting that the daruma doll outside the restaurant only has one eye filled in. The goal has been set, the achievement is coming. Who says they won’t get there?